What a delectable dessert. 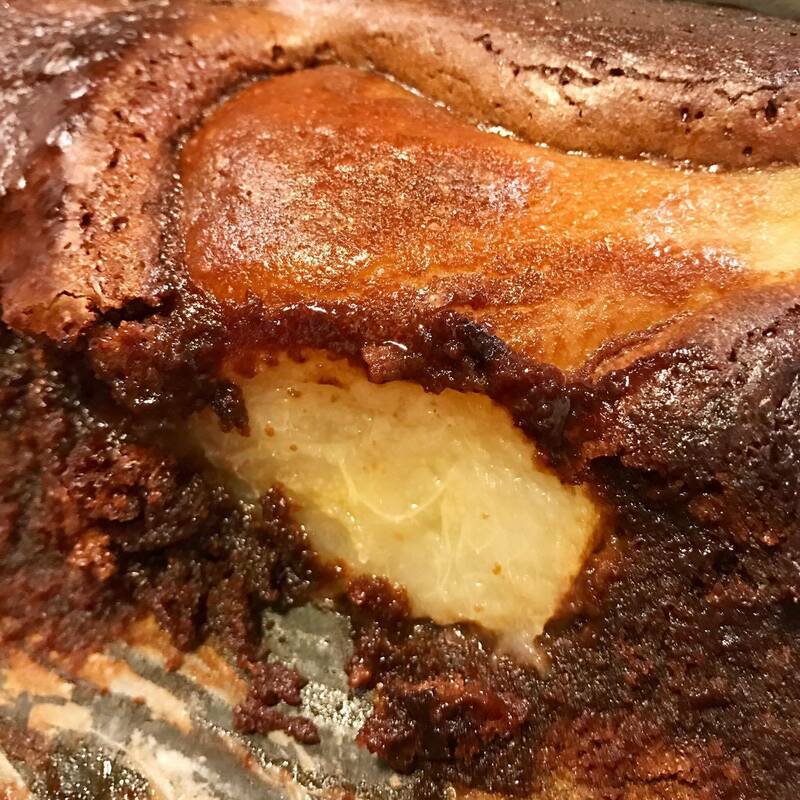 It’s a rich, fudgey brownie, but the freshly poached pears lighten it somewhat, making it not so sweet and extremely more-ish. Poaching the pears is definitely what takes the longest, but that is really a matter of chucking everything into a pot and leaving it to simmer for almost an hour. I didn’t have a great dish for cooking – it would be ideal to have separate ramekins for each pear, but I just used half of a casserole dish. While this didn’t present quite so well, because the mixture was a singular mass it meant that the brownie was perhaps more gooey than it may have been otherwise. In a pot, add the pears, water, vanilla, cinnamon, star anise, brown sugar and first measure of caster sugar. Bring to a boil and cover with a lid. Leave to simmer for about 45 minutes (you don’t want the pears to be too soft). Preheat oven to 200°C bake. In one bowl, melt the chocolate and the butter. Separately, mix the second measure of caster sugar, flour and eggs. Stir through the melted chocolate. In a dish (casserole or ramekin) sit each of the pears. Pour the chocolate brownie mixture into the dish, so that hopefully the mixture reaches about 2/3 of the way up the pear. You may need to turn or rotate the pears to ensure better coverage. 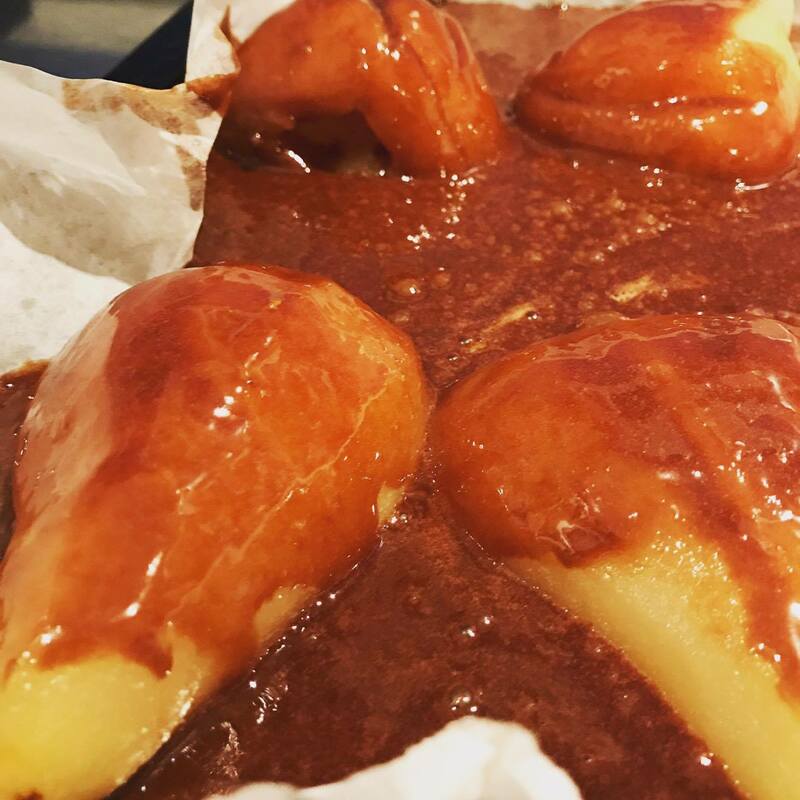 Bake the pears in the brownie for about 20 minutes. The less you cook it the more gooey the brownie will be, but I suppose there is a limit so that you don’t just end up eating batter! Serve with ice-cream or yoghurt and a light dusting of icing sugar.